If you’re a purist, you know there’s nothing quite like a smoked pulled pork, but I mean c’mon. You have to have skills and time, and Instant Pot Pulled Pork? By the time you pile this luscious tangle of smoky deliciousness onto a bun and slather it with a little sauce, you’re going to be in heaven!! No Instant Pot? Try this Slow Cooker Pulled Pork or this recipe for Slow Cooker Pulled Pork or Brisket. This is truly a wonderful meal, maybe the perfect meal for a big weekend. 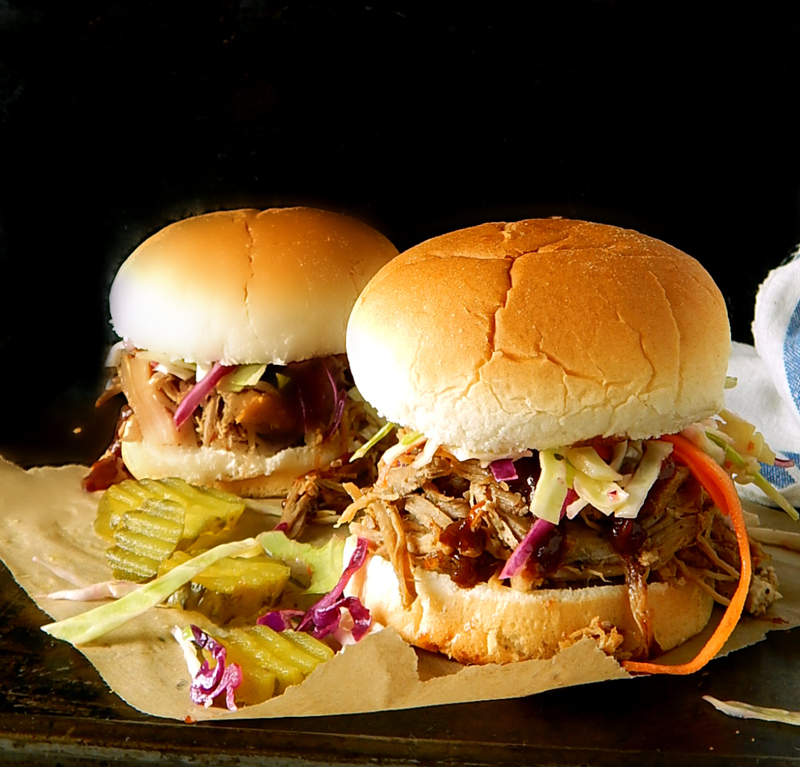 Serve up your Instant Pot Pulled Pork on buns with a little cole-slaw and chips, maybe some baked beans, and you’ve got an “instant” barbecue on your hands. It’s just the thing for a busy weekend, maybe with the kids, or maybe you’re hosting kids and grandkids? You won’t be stuck in the kitchen! If you don’t want to go the sandwich route or have leftovers, there are so many things to do with your Instant Pot Pulled Pork. The list is long and if you’re a follower, you know I’ve gone on and on in various posts about how to use shredded pork shoulder. I’ve gathered a lot of ideas up on my post on Inspiration and Recipes for Leftover Pork. I’m also not going to waste the drippings or the broth, and have plans for both! I read a post by a woman who was NOT in love with her Instant Pot. (Not my experience; I loooove mine!) She complained that there is often excess liquid (the IP cooks with steam and in the enclosed environment, there’s no evaporation,) Folks, that liquid is gold: concentrated flavor. Depending on the recipe, maybe you’ll thicken or reduce. This time I’ll toss a cup of that broth back into the Pulled Pork & use the rest in Vietnamese Pork Noodle Soup. Since I’m planning on making tamales with some of the shredded pork, I’m saving the drippings, too. I love zero waste! Recipes coming soon! The IP does a marvelous job of rending out the fat. This recipe is an absolute breeze. I don’t brown. I don’t add any sauce. I don’t do anything fussy. I just give it almost the same treatment I do when I smoke a pork shoulder. The only difference: for quicker cooking, I break the shoulder down into large chunks. If there is a bone, just makes large cuts. I rub the pork shoulder with one of my favorite rib rubs, and toss it in the IP and sprinkle with the magic ingredient, Liquid Smoke. Links are on the bottom of the page, but feel free to use your favorite rub. I add the rack that comes with the IP to the bottom, pile on the pork and use a little more water than usual. When you open the IP, most of the shoulder will be submerged in liquid, and you might wonder, “Why the rack?” It’s because I like the way the IP kind of carmelizes and slightly browns those pieces that are jutting up out of the liquid and that gives a little variance in the texture. I’ve found four to five pounds of pork shoulder works best in my 6 quart Duo; any larger and it takes a lot of time and might need to be opened and stirred. As is you’ll be looking at about 20 minutes to come to pressure, about 55 to cook and then about 15 to 20 for a slow release. (Most meats benefit from a slow release rather than a quick one.) Five-minute prep, less than 2 hours total for pork shoulder? I’m all over that! When buying pork shoulder, you want to be aware that after the fat and collagen have all melted away, you’ll be left with about 1/2 the amount (poundage wise) that you start with. And you’ll probably want to allow for a rough average of about 6 ounces per person, depending of course, if they’re all adults or a mix of adult and kids. At my house, that depends on whether my son will be there or not! He’s a biiiiiig eater! Anytime you’re cooking with Pork Shoulder, you have the opportunity to bring in a great meal at a budget price. Watch for pork to drop to a low during fall to late winter, with lows again just a month or two before any holiday that features ham. They have to do something with the rest of the pork when all those hams are being prepared for Christmas and/or Easter. If you miss that timeline, pay attention to the pricing in your area and know the highs and lows. At a really great sale, I can find pork shoulder from around 99 cents a pound (last week, in a bit of a fluke, the sale price was 49 cents, but that’s not normal) and those great sales can range up to around $1.69 a pound. Buy at a low and freeze. If the roast is huge, divide it up. See more on my post on Buying a Large Pork Roast. Instant Pot Pulled Pork served with my Cuban Cabbage Salad. A luscious tangle of pulled pork from the Instant Pot! In a fraction of the time. Rub Pork Shoulder with rib rub, wrap and rest overnight in the refrigerator if time allows. Add rack and 2 cups water to the Instant Pot. Add chunks pork shoulder on top of rack. Sprinkle with liquid smoke. Seal the Instant Pot and set to high pressure, 55 minutes. When finished, allow to go to keep warm function and use a natural release, about 15 to 20 minutes. Strain the pork over a bowl, add about a cup of the juices back in with the pork. See note. Serve on buns with your favorite barbecue sauce. Save the juices and fat if you have a later use for them. The fat separates easily from the juices after it hardens in the refrigerator. This entry was posted in Click here for Bargain Meals, Click here for Fabulous Food Posts and tagged Instant Pot, Pork, Pork Shoulder Recipe, Pulled Pork. Bookmark the permalink. Have you been taking photography lessons? Your photos are looking amazing! C’mon share some tips 😄 I always struggle with lighting and white balance. Oh my gosh, Angie, I am like an ant compared to a giant! You are the best food photographer I “know”!! And I did get some lights, and have used them on the last few posts! Still not where I want them to be, but it IS helping!! And thanks for noticing! Mollie, could you use less water? Like 1 cup instead of 2? What about cooking it in some kind of sauce? What do you think? I have a chunked pork shoulder I was going to cook on Monday in the Instant Pot. Sure, you can use one cup and yes, you can put sauce right in with it – I’d use the water for the steam and put the sauce right over the top so you don’t risk any scorching on the bottom. Yum. I love how you made up the sandwiches. Really lovely.